PALM BEACH, Fla. – March 18 2019 – Barrett-Jackson will roll in to Palm Beach this April with an extraordinary docket filled with hard-to-find, low-mileage American muscle cars from the 1990s and 2000s. Barrett-Jackson’s 17th Annual Palm Beach Auction, which will be held April 11-13, 2019, at the South Florida Fairgrounds, is the region’s premier automotive lifestyle event filled with four days of collector cars and automobilia, as well as immersive activities and interactive exhibits designed for the entire family. Among the low-mileage domestic vehicles crossing the block in Palm Beach is a 1993 Ford Mustang Cobra R (Lot #674.1) with only 583 miles. The Ford Mustang Cobra R is a culmination of everything Ford learned about the Fox Body Mustang when it first rolled into production in 1979, becoming the crown jewel of Fox Bodies at the time. One such example heading to Palm Beach is a 1993 Ford Mustang Cobra R (Lot #674.1). This pristine Cobra R is number 73 of only 107 made, and has a mere 589 miles on the clock. In 1995, Ford’s Special Vehicle Team division one-upped the 1993 Cobra R to be a more formidable track car with multiple performance modifications, including the 5.8-liter V8 engine and Competition Package. Also crossing the block this April is a 1995 Ford SVT Mustang Cobra R (Lot #393.1). 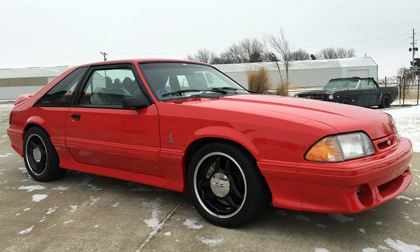 Number 55 of 250 made, this non-dealer-prepped Mustang shows 206 actual miles on the odometer. Number 34 of 810 coupes built in 1996, a Corvette Grand Sport (Lot #361) on the docket was built to commemorate the 1963 Grand Sport racing cars and has only 1,490 actual miles. With only 3,600 original miles, a 2009 Corvette ZR1 (Lot #662) represents the introductory year of the ZR1, which was the first Corvette to exceed 200 mph and achieve supercar performance. Also on offer is a one-owner 1994 Camaro Z/28 1LE (Lot #123), one of only 135 built and showing only 195 actual miles. The 1LE package was designed for the SCCA racing with upgraded performance features, making it the ultimate fourth-generation Camaro. Click here to view the 2019 Palm Beach Auction docket. For more information on becoming a bidder for the 2019 Palm Beach Auction, follow the link to www.Barrett-Jackson.com/bid. To submit an application to consign at the 2019 Palm Beach Auction, click here.